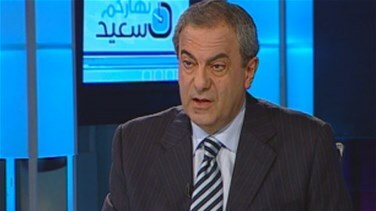 MP Farid Elias Khazen said on Saturday that the Lebanese-Syrian border is controlled due to the security plan approved by the Lebanese cabinet. He also noted that all political factions in Lebanon are fully aware of the dangers of the Shiite-Sunnite strife, adding that they are deploying efforts to avoid sedition. As for the ongoing contacts between the Free Patriotic Movement and the Future Movement, Khazen said that FPM leader MP Michel Aoun is able to contact all political sides amid the major political split in the country. On the Iraqi dossier, Khazen stressed that the fast expansion of the Islamic State in Iraq and the Levant (ISIL) in Iraq is the direct repercussions of the Iraq war in 2013, as well as the Syrian crisis. Khazen's comments were made during an interview with Nharkom Said TV show in which he asserted that any intervention of the world powers in Iraq will lead to major sectarian war. He also added that the fast collapse of the Iraq army raises several questions. On Monday, Fighters from the Islamic State of Iraq and the Levant (ISIL) group began an offensive in Iraq taking a chunk of mostly Sunni Arab territory in the north. The attack led by ISIL, which operates in both countries, has brought the Iraqi army to the brink of collapse.